There are plenty of dirt roads and trails in Nepal to meet every mountain biker’s wildest fantasy – all set in the backdrop of majestic mountains. From day trips to weeks of cycling – there’s everything even the Yak Attack – the worlds highest mountain bike race on earth crossing the Thorung La Pass at 5416m. Cycling holidays vary from day rides to weeks for example the around the Annapurna which lasts for 15 days. 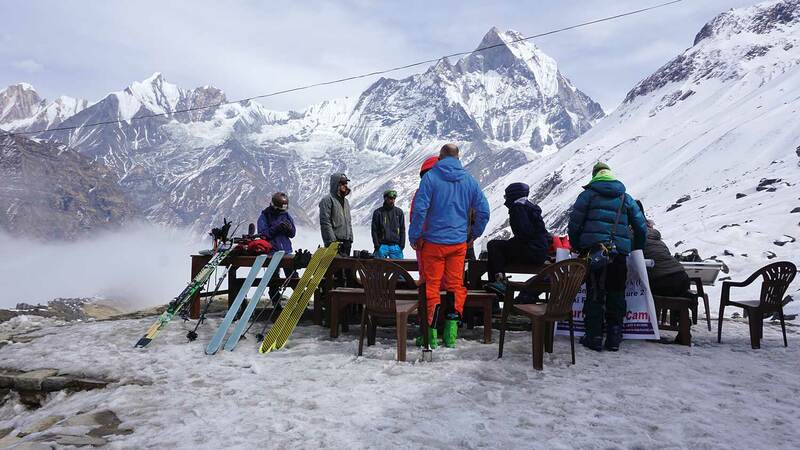 Riders can explore rims and ridges of Kathmandu and Pokhara through off routes that weave in and out of the cities along which food and accommodation are easily available. Cycles can easily be hired from cycle shops in Thamel in Kathmandu and in Lakeside in Pokhara. Prices start at around Rs. 500 per day. Many cycling holidays booked from travel agencies will include the cost of bike hire but some won’t so that’s always worth checking. In Kathmandu day cycling trips to any of the surrounding hill stations is a great idea. Drive up to Nagarkot, Jamacho, Godavari and then cycle back downhill 20-45 km back to Kathmandu. You can also cycle up the hill and back down again usually after an overnight stay at the hilltop of Nagarkot, Chisapani, Dhulikhel and Namobuddha. Or try a combined route over 5 days that takes you to the best hilltops in Kathmandu for stunning views of the mountains. 21 to 27 gear bicycles are recommended for most biking in Nepal since the terrain is often very rough. While every season has its own appeal for cycling, monsoon which runs from mid June to late September will offer little views of mountains and lots of rain instead. Ideal riding conditions are in winter from October to end of January with clear views of mountains and dry tracks. From February to May which is spring/summer riding is pleasant but tends to get very hot towards the end with possibility of showers. Cycling in groups with a minimum of 2 and maximum 16 people makes for safer travel as well as cheaper. For those into serious biking here are a couple of challenging biking route guides in Nepal. Sarankot finally ending up in Pokhara. bikes will have to be carried. Thorong Phedi, Kagbeni, Tatopani, Beni and end up in Pokhara. 5416m will leave you breathless, literally!